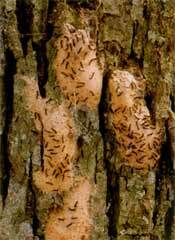 In spring when weather warms and leaves open, caterpillars hatch from eggs laid the previous summer. 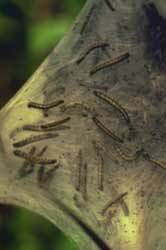 Caterpillars feed on newly expanded leaves. About 7 weeks after egg hatch, mature caterpillars stop feeding, find a sheltered resting spot and pupate, forming a protective shell. 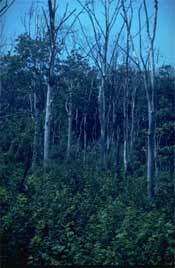 Forest defoliated by gypsy moth. 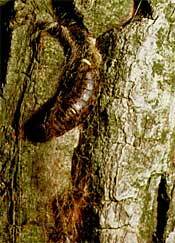 Don't confuse Gypsy moth caterpillar with other leaf feeding caterpillars present in spring. 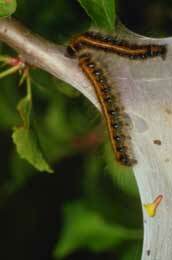 Here is Eastern Tent Caterpillar, a web-forming caterpillar. 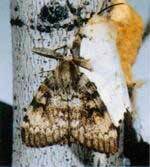 This site is for use by municipal forestry departments, park districts, the green industry and other concerned agencies to report gypsy moth findings in Northeastern Illinois. 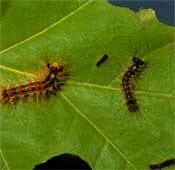 The site will be monitored by University of Illinois Extension staff and the Illinois Department of Agriculture to assist in the effort to suppress the spread of gypsy moth.